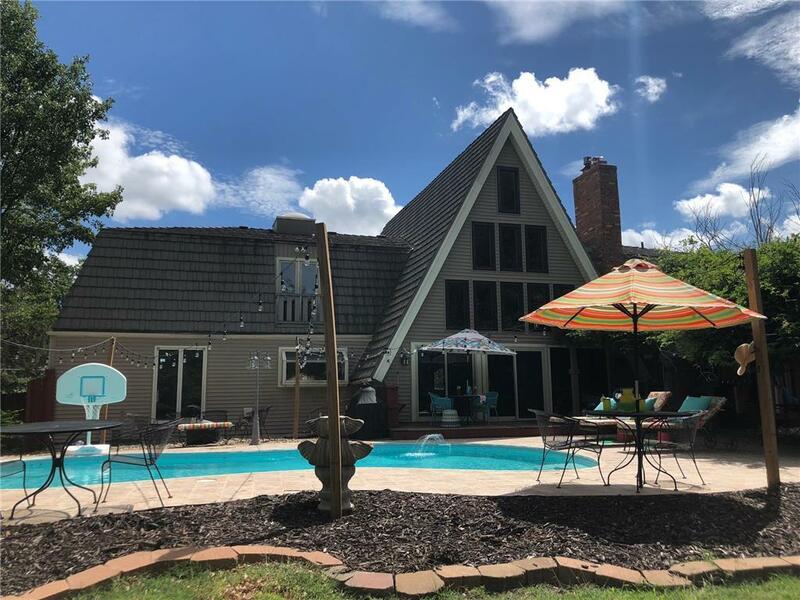 5710 N Indiana Avenue, Gladstone, MO.| MLS# 2139760 | Mary Giangalanti & Associates Kansas City Homes for Sale, Property Search in Kansas City & Surrounding Areas. CHRISTMAS SPECIAL!ONE OF A KIND Colorado A Frame Chalet.Soaring 30ft ceilings, wall of windows brings in natural light!20ft Stone wood-burning fireplace in Great Room,hdwd floors throughout.New windows,Tankless HWH, Unique 2-story Master suite, with private staircase leading to home office.Second bedroom poolside for guests.Spacious secondary bedrooms;baths w/granite countertops and vessel sinks.Immaculate landscaping with Alll NEW In-ground heated Pool,two decks and Gazebo for outdoor entertaining. A true retreat! Directions: From Antioch Road turn right onto 57th Terrace. Home is on an acre lot on the corner of N Indiana and 57th Terrace. Thank you for showing this incredible ONE of a KIND home!